On the 16th (Fri), stroll through Henley Beach and then trek along River Torrens Linear Park Trail. 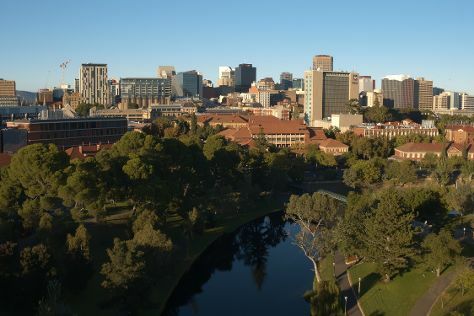 To see where to stay, reviews, other places to visit, and other tourist information, read our Adelaide trip itinerary maker website . Milan, Italy to Adelaide is an approximately 25-hour flight. You can also do a combination of flight, ferry, and bus; or do a combination of flight and bus. You'll lose 8 hours traveling from Milan to Adelaide due to the time zone difference. Plan for much colder temperatures traveling from Milan in August, with highs in Adelaide at 18°C and lows at 8°C. You will have some time to spend on the 17th (Sat) before leaving for Alice Springs. Start off your visit on the 17th (Sat): explore the wealth of natural beauty at Emily Gap and then identify plant and animal life at The Emily and Jessie Gaps Nature Park. On your second day here, explore the striking landscape of Finke Gorge National Park. To find photos, reviews, ratings, and more tourist information, use the Alice Springs trip itinerary builder . Fly from Adelaide to Alice Springs in 4.5 hours. Alternatively, you can drive; or take a bus. Traveling from Adelaide in August, you will find days in Alice Springs are somewhat warmer (27°C), and nights are about the same (5°C). Wrap up your sightseeing on the 19th (Mon) to allow time to travel to Kings Canyon. 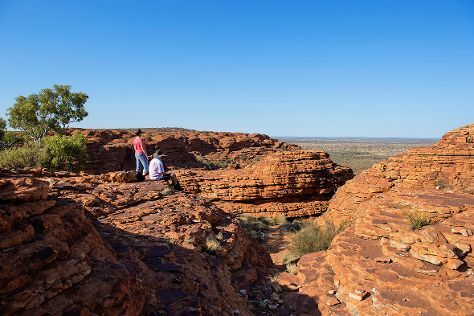 Watarrka National Park has been added to your itinerary. To see reviews, other places to visit, maps, and other tourist information, go to the Kings Canyon road trip app . Traveling by car from Alice Springs to Kings Canyon takes 6 hours. 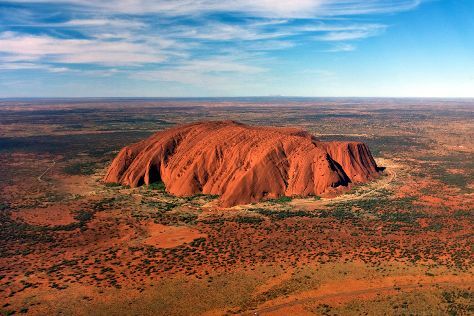 You will have some time to spend on the 21st (Wed) before leaving for Uluru-Kata Tjuta National Park. On the 22nd (Thu), you'll have a packed day of sightseeing: trek along Kuniya Walk, explore the activities along Mutitjulu Waterhole, explore the striking landscape at Uluru, then view the masterpieces at Walkatjara Art, and finally take an in-depth tour of Uluru-Kata Tjuta Cultural Centre. To find where to stay, other places to visit, reviews, and more tourist information, read Uluru-Kata Tjuta National Park travel route planner . You can drive from Kings Canyon to Uluru-Kata Tjuta National Park in 4 hours. In August, daily temperatures in Uluru-Kata Tjuta National Park can reach 27°C, while at night they dip to 6°C. Finish your sightseeing early on the 23rd (Fri) to allow enough time to travel to Jabiru (Kakadu National Park). Jabiru is a town in the Northern Territory of Australia. Kick off your visit on the 24th (Sat): don't miss a visit to Bardedjilidji Walk, then look for all kinds of wild species at Anbangbang Billabong, then take in the dramatic natural features at Nanguluwur Art Site, and finally look for all kinds of wild species at Maguk Gorge. On the 25th (Sun), you'll have a packed day of sightseeing: explore the ancient world of Ubirr and then look for all kinds of wild species at Cahills Crossing. To see maps, ratings, reviews, and more tourist information, read Jabiru (Kakadu National Park) trip itinerary tool . Traveling by combination of flight and bus from Uluru-Kata Tjuta National Park to Jabiru (Kakadu National Park) takes 9.5 hours. Alternatively, you can drive; or do a combination of flight and car. Finish up your sightseeing early on the 26th (Mon) so you can travel to Litchfield National Park. Start off your visit on the 26th (Mon): tour the pleasant surroundings at Walker Creek, then see the world from above with a helicopter tour, and then take in the dramatic scenery at Wangi Falls. 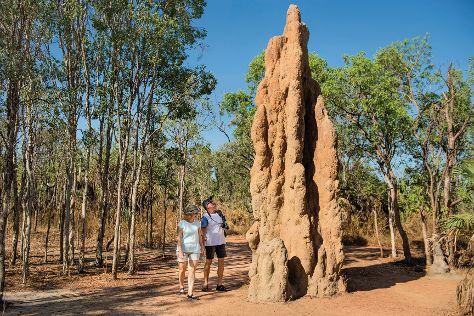 On your second day here, explore the striking landscape at Magnetic Termite Mounds, then contemplate the waterfront views at Buley Rockhole, and then take in the dramatic scenery at Florence Falls. Plan a Litchfield National Park trip in moments using our itinerary builder. The Route module can help you plan travel from Jabiru (Kakadu National Park) to Litchfield National Park. 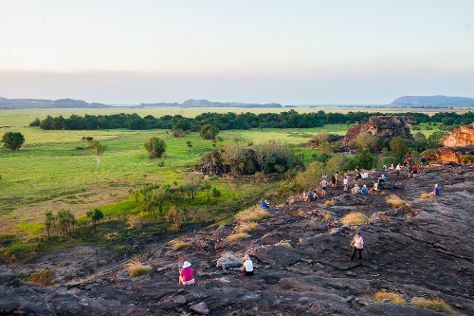 In August in Litchfield National Park, expect temperatures between 37°C during the day and 22°C at night. Wrap up your sightseeing on the 28th (Wed) early enough to travel to Purnululu National Park. Start off your visit on the 28th (Wed): explore the striking landscape at Purnululu National Park. Get ready for a full day of sightseeing on the 29th (Thu): take in the dramatic natural features at Bungle Bungle Range and then take in the dramatic natural features at Bungle Bungles Range. To see ratings, reviews, photos, and tourist information, use the Purnululu National Park route planner. The Route module can help you plan travel from Litchfield National Park to Purnululu National Park. Due to the time zone difference, you'll gain 1 hour traveling from Litchfield National Park to Purnululu National Park. Cap off your sightseeing on the 29th (Thu) early enough to travel to Maleny. Kick off your visit on the 31st (Sat): take in the dramatic scenery at Gardners Falls, then look for gifts at Fudgyboombahs, then hike along Mary Cairncross Scenic Reserve, and finally learn about winemaking at Maleny Mountain Wines. Here are some ideas for day two: explore the striking landscape of Glass House Mountains National Park. To find maps, traveler tips, more things to do, and other tourist information, refer to the Maleny itinerary builder . You can drive from Purnululu National Park to Maleny in 47 hours. Due to the time zone difference, you'll lose 2 hours traveling from Purnululu National Park to Maleny. Expect a daytime high around 25°C in August, and nighttime lows around 11°C. Finish your sightseeing early on the 1st (Sun) so you can drive to Noosa. 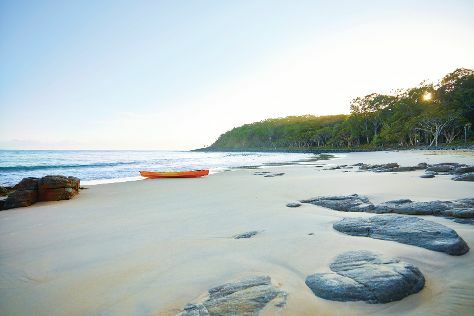 On the 2nd (Mon), explore the striking landscape of Noosa National Park. On the 3rd (Tue), you'll have a packed day of sightseeing: admire the natural beauty at Noosa Botanic Gardens, then kick back and relax at Marcoola Beach, and then get great views at Laguna Lookout. For reviews, other places to visit, ratings, and more tourist information, refer to the Noosa trip itinerary maker website . You can drive from Maleny to Noosa in 1.5 hours. Other options are to take a bus; or take a train. Wrap up your sightseeing on the 3rd (Tue) early enough to travel to Fraser Island. Start off your visit on the 4th (Wed): delve into the lush surroundings at Central Station Rainforest and then explore the activities along Lake McKenzie. On the 5th (Thu), you'll have a packed day of sightseeing: enjoy the sand and surf at Seventy-Five Mile Beach. To see traveler tips, ratings, more things to do, and other tourist information, go to the Fraser Island tour itinerary builder tool . You can do a combination of car and ferry from Noosa to Fraser Island in 7 hours. Alternatively, you can do a combination of train, ferry, and car; or do a combination of bus, ferry, and car. 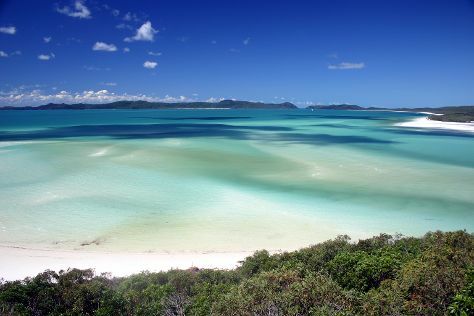 Wrap up your sightseeing by early afternoon on the 5th (Thu) to allow enough time to travel to Whitsunday Island. Kick off your visit on the 6th (Fri): kick back and relax at Whitehaven Beach and then contemplate the waterfront views at Hill Inlet. Here are some ideas for day two: step off the mainland to explore Whitsunday Islands National Park. To see other places to visit, photos, maps, and tourist information, go to the Whitsunday Island day trip site . Do a combination of car, ferry, and flight from Fraser Island to Whitsunday Island in 10.5 hours. Alternatively, you can do a combination of car, ferry, and train; or do a combination of car, ferry, and bus. September in Whitsunday Island sees daily highs of 32°C and lows of 17°C at night. Wrap up your sightseeing by early afternoon on the 7th (Sat) to allow enough time to travel to Hamilton Island. Kick off your visit on the 8th (Sun): see some colorful creatures with a scuba or snorkeling tour. Get ready for a full day of sightseeing on the next day: tee off at Hamilton Island Golf Club and then stroll through Catseye Beach. To see ratings, maps, traveler tips, and other tourist information, go to the Hamilton Island day trip planner . The Route module can help you plan travel from Whitsunday Island to Hamilton Island. While traveling from Whitsunday Island, expect little chillier days and somewhat warmer nights in Hamilton Island, ranging from highs of 29°C to lows of 23°C. Finish your sightseeing early on the 9th (Mon) so you can travel to Townsville. Kick off your visit on the 10th (Tue): browse the exhibits of The Drill Hall Studio, then tour the pleasant surroundings at The Strand, and then hike along Alligator Falls Track. On the next day, see what you can catch with a fishing tour. To find ratings, other places to visit, photos, and more tourist information, you can read our Townsville tour itinerary builder app . You can do a combination of ferry and bus from Hamilton Island to Townsville in 4.5 hours. Alternatively, you can fly; or do a combination of ferry and train. In September, daily temperatures in Townsville can reach 32°C, while at night they dip to 21°C. Finish your sightseeing early on the 12th (Thu) so you can travel to Port Douglas. Discover out-of-the-way places like Opal Reef and St Mary’s by The Sea chapel. Step out of the city life by going to Photography Tours and Hartley's Crocodile Adventures. Spend the 12th (Thu) among aquatic life with a scuba or snorkeling tour. There's more to do: stroll through Four Mile Beach and stop by Coffee Works Port Douglas. For traveler tips, maps, ratings, and other tourist information, use the Port Douglas online trip maker . Traveling by combination of flight and shuttle from Townsville to Port Douglas takes 4.5 hours. Alternatively, you can drive; or do a combination of bus and shuttle. In September, daytime highs in Port Douglas are 33°C, while nighttime lows are 22°C. Finish your sightseeing early on the 15th (Sun) so you can drive to Cairns. You'll discover tucked-away gems like Curtain Fig National Park and The Bat Hospital Visitor Centre. Get in touch with nature at Scuba & Snorkeling and Esplanade Boardwalk. Change things up with these side-trips from Cairns: Cathedral Fig Tree (in Yungaburra) and The Crystal Caves (in Atherton). Spend the 16th (Mon) wandering through the wild on a nature and wildlife tour. There's much more to do: take in the dramatic scenery at Josephine Falls, cross one thing off your bucket list with a skydiving experience, take in the pleasant sights at Red Arrow Walk, and take in the exciting artwork at Cairns Art Gallery. For ratings, more things to do, other places to visit, and tourist information, go to the Cairns online visit planner . You can drive from Port Douglas to Cairns in 1.5 hours. Other options are to take a bus; or take a shuttle. In September, plan for daily highs up to 33°C, and evening lows to 22°C. On the 21st (Sat), you'll have the morning to explore before heading back home.